Before we talk about the hotel promotion ideas that you can use for your hotel, let’s talk about how important promoting your hotel is? Let me guess, as important as adding spice to the stew, right? We’re sure, you must be making numerous attempts to do innovative hotel promotions at your place. But, do you think those traditional practices are enough to quench your urge of growing your hotel business? Obviously, you need more than just those traditional practices. So, we are giving you a list of 17 best hotel promotion ideas you can implement to dig out the gold from the black soil (we’re telling you, it’ll work like a Midas touch for your hotel). Now, there are some classic hotel promotion ideas which were, are, and will be used by many hoteliers in the upcoming future (we’re sure you must’ve tried these too). The old-school hotel promotions do have prominence until today, but on one condition – you have to be creative with them. As change is the only constant you know; you cannot just use those old-school ways to bring breakthroughs in the market. That’s why you need to bring that radical change in the ways you promote your hotel and transform the way you put them to use. Let’s dig deeper into these old (yet powerful) tactics one by one. Usually, a hotel’s year is divided into two. One is the peak season, and the other is the off-peak or weak season. And a hotel’s success is majorly dependant on how well the weak seasons are managed. And truth be told, you can’t let a single room go unoccupied in any of 365 days. See, for peak seasons; you’re already getting enough of the bookings and business. Yet, you can try those customary ways of running different types of promotions, selling bundles of packages and even setting up advanced deals to bring in some excitement to your guests. The hotel promotion ideas for weak seasons start with doing something uncommon. Try celebrating and inviting guests for various days like Environment Day, International Dance Day and such likes. Last minute deals and packages for short stays is one good way to promote your hotel. If you’re having a scenic landscape beside your hotel, you can offer packages for pre-wedding photography (that’s the in-thing these days). If you have a banquet at your place, you can get into catering and host weddings, parties and corporate events. And these things will work all-the-year-round. Events like festival celebrations, music and dance festivals (Tomorrowland, Sunburn.. rings a bell? ), expos and exhibitions, roadshows are the mainstream things nowadays for millennials. One of the golden hotel promotion ideas revolves around you making the most of these events by tying up with the event planners and sponsors and even hosting few events at your place. This way, you’ll be able to attract a pretty good number of guests. Advertising with these events via hoardings, TV ads, can also work as a festive hotel promotion method. You can even try being a bit more creative with this idea by organizing a few out of the box events such as food fair, creative art fair, and workshops on crafts & cocktails, dance & sculpt, pilates or so to add a new note to lure your guests. Loyalty programs are an excellent means to retain your existing guests (and a long-standing hotel promotion idea). Now don’t try to attract them by giving those usual (and uninviting) points or similar things as a part of these loyalty programs. Reward them with something that is of real value to your guests and gaining you profit as well. Something like..1 night’s stay free the next time they come, 2 nights free on group bookings and other such ideas. Evidently, promotion of hotel is a topic that is ever-evolving. You constantly need to keep an eye on what’s in vogue, and which ideas are as dead as a dodo. Innovative hotel promotion ideas are welcomed these days with balanced fervor and skepticism. If one idea works for your competitor, doesn’t mean it may work for you. However, at the same time, you also need to be open to versatile techniques to promote your hotel. Let’s discuss a few modern tactics that will add to the numbers of your guest, gist and gross. Now OTAs are a sure thing at present. Even though you might be doing great on the few OTAs you’re listed on, the secret herb to grow your business is to connect with maximum OTAs and metasearch engines. This will increase your hotel’s credibility, promote your hotel and even give your hotel a much-needed exposure. Here are more benefits to have more OTA connections for your hotel. Besides, you can also be a part of the promotions that OTAs run on their end. Different OTAs have different techniques to get you bookings. Moreover, you should also not miss out on the relevant OTAs for your region and accommodation type. Like, if you’re a hotel in China, then Ctrip works best for you; and if you’re a hostel, then HostelWorld is a good option. Your website is the face of your hotel and at the same time a salient player in your hotel promotion and business growth. Those guests who have found your hotel through Google or any OTA will end up landing on your website. So, you need to keep updating your hotel website in routine. They’ve kept attractive widgets which make the visitors reach the booking engine and book directly. Their location, services, deals, experiences they offer and even an exciting photo gallery is well highlighted. Though if you don’t have a hotel website, then get it developed from someone who provides hotel website design as a service. Make sure you highlight your amenities and make the website easily navigable and dynamic to let your visitors explore your website from wherever they want. Look, it might happen often that your hotel website may be getting hoards of visitors, but when it comes to bookings; you might get disappointed. And you’re already doing well on the OTAs. 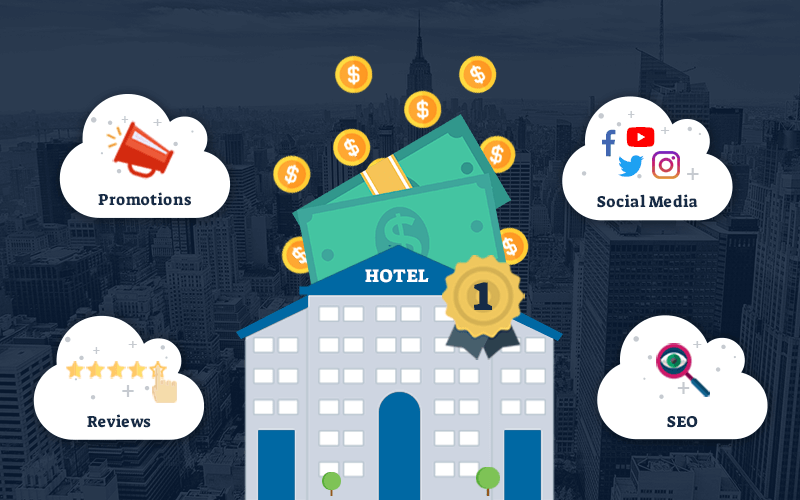 So why not turn your hotel website into a revenue-generating one? For that, you can get started with some ready plug and play widgets that turn your website lookers into bookers. These widgets help you accentuate your hotel’s amenities and promotions, and eventually captivate your website visitors to reach your booking engine page and directly book with you. Search engine optimization or SEO refers to a process by which your hotel website’s rank gets better on the search engines. That means, when people search for you or for hotels similar to yours, there’s a possibility that your hotel website comes in the search results. Start with the keywords research. DO NOT literally stuff the keywords in your website or other content. Instead, focus on making your content rich and crisp with relevant keywords. Interlink all your content and there you are, visible in all the related searches people make. Often, you may wonder that you’re doing everything possible to market your hotel. You may have worked hard on your hotel website; but what if you don’t know how it’s impacting on your visitors? Whether you’re getting enough visitors or not? Tracking your audience’s behavior with Google Analytics and similar tools is an ideal way to know how your hotel website is performing and how is the experience of the visitors while exploring your website. Based on this data, you can easily gauge visitor behavior and try different hotel promotion ideas to increase engagement and even direct bookings. Hotels these days are into providing personalized guest experience; either through their services or through some other means. And that’s what is working among the many hotel promotion ideas to deploy. A satisfied guest is the best business strategy. Just some attention from your staff towards your guests’ behavior and preferences can help you go a long way in your hotel promotion. To start with, you can send them pre-arrival emails, which include details on how to reach you, your contact details, and such likes. The right thing at the right time will give a positive start to their experience. Next, after they’ve checked in, you can offer some city tours, invite them in any event that your hotel might be hosting, let them know about the specials on that day and plenitude of other things. This way, your guests will have a better experience and you’ll even be able to promote your happenings well. In the same vein, post their check-out, you can put up some offers for their next stay, promote your hotel’s happenings, ask them for reviews and so on. In essence, when you make efforts to engross with your guest, it imparts a feeling that you really care about them. And this works like a wonder in the promotion of your hotel. Reviews presently are a decisive parameter for the guest. And clearly, reviews for you are that goose which lays golden eggs (make sure you don’t kill it). You might never know how a single review affects your guests and future bookings. That’s why your hotel reviews must be handled with extreme care. At the same time, they are one of the quintessential hotel promotion ideas; being generated by the user, for the user, and from the user. Focusing on your hotel reviews and reputation management should be on your task list henceforth. Collect as many reviews for your hotel as you can, and fixate on responding to them. Employing an online hotel reputation management software for this can help you handle and make the most of your online reviews effectively. Besides, you can even start getting more reviews on TripAdvisor through the TripAdvisor Review Express Program for free. You can explore more about it here. Did you know if Facebook was a country, it’d be the most populated country on the globe? (Not surprising, right?) And that’s why Facebook is a must-have for hotels like you these days. Among your hotel promotion ideas, maintaining a Facebook page of your hotel with attractive posts and that of guests enjoying their experience is a must. Here, you’ll surely come across probable prospects. Interact with your audience regularly. Request them to tag you in their pictures (you can also tag them, BTW). Let your audience know about those special deals and discounts you’re running. Facebook also helps you by offering to boost your posts to the wider audience. Moreover, your Facebook page can entirely turn into a cash cow and get you maximum direct bookings if you integrate it with a proper hotel booking engine. Instagram is the second most widely used social media platform after Facebook. Great photos, short videos, and Instagram stories will give your hotel and profile the much-needed boost, which ultimately poses as one of the excellent hotel promotion ideas. Post about the weddings or events which took place at your hotel or the ones which you hosted and even some good photographs of the scenery around (well, there are hundreds of things you can post). Instagram uses hashtags a lot. Make maximum use of those hashtags as they can make your posts more discoverable. Identify the relevant hashtags which work for you, and regularly add them to your posts. Lastly, don’t forget to request your guests to tag you in their photos. It can increase your credibility on Instagram to a great extent. With an estimated 300 hours of video being uploaded every minute, you can clearly gauge the favoritism of this site. Add your hotel’s video tours on your YouTube channel. Besides, if you’re offering adventure activities at your place; then YouTube is the best place to showcase those activities with short video clips of guests during those adventures. YouTube ads are also one thing that you can dig deeper into – as one of the effective hotel promotion ideas. Searching on Google or any travel website is the very first step a guest takes while looking for a hotel. And this is a credible fact which can be used as a part of your hotel promotion ideas. Get your hotel listed in Google My Business to appear on the podium, if a relevant search is being made for your hotel, or hotels like you or in your area. Add each and every detail of your business to the listing. Hotel’s operating hours, phone number, website URL, pictures, and any additional details you want to make easily accessible to your guests. Guests can easily click “Website” or “Directions” which increases the chances of them to book directly with you instead of choosing to book from an OTA. With this step, your guests can easily find and rate your hotel. You’ve already appeared in the search with Business listings. Now, how to make sure that your guests are able to choose your hotel wisely? Well, that’s when Google Hotel Ads comes in the picture. This exclusive service available only through Google’s authorized integration partners is one of Google’s successful endeavors to help hotels increase their revenue without the jumble of registering on OTAs and such likes. It’s a compelling way to promote your hotel, as it will help your guests book with you right from the search results. This increases your direct bookings, which then leads to the promotion of your hotel. Now travel writers and bloggers are the most recent fads these days. Imagine, being paid to travel (the ultimate bliss!). Well, believe it or not; but these travel writers and bloggers hold a lot of influence in the market. They have a huge fan-following and travelers essentially listen to their suggestions and get inspired by the experiences they have. You too can keep up with this trend by inviting those travel bloggers and influencers at your hotel. Reach out to them and begin your collaboration as a part of your hotel promotion ideas. You can either pay them or offer them a complimentary stay at your hotel. Google AdWords – Play around with Search and Display ads from Google Adwords. These ads will help you acquire direct bookings by reaching up to the right target audience, all the while maintaining your budget. Remarketing ads – Now, did you ever search for something on Amazon, and then that search followed you everywhere? You know, with lower prices, some deals or something similar? Well, that’s called REMARKETING, which is also a beneficial way to promote your hotel. It helps your website visitors keep you in their mind, and leave an impact. Facebook ads – Facebook provides this beautiful feature of Facebook Ads, using which you can easily promote your Facebook page and posts to the relevant audience. This increases your visibility and gives a significant path to hotel promotion. Well, these 17 hot off the press hotel promotion ideas are a part of the most impactful bunch of practices that you can follow to grow your hotel business. Identify what works the best for you from these ideas, and have a go at them in your next strategy. An integrated hotel software, which includes cloud-based hotel PMS, hotel booking engine and a channel manager is a productive tool which not only aids you in managing your day-to-day hotel operations; but also assists you in several ways to promote your hotel.